Note: Other refers to electricity generated from the non-biogenic portion of municipal solid waste, other non-renewable waste fuels, hydroelectric pumped storage, other energy storage, and other sources. 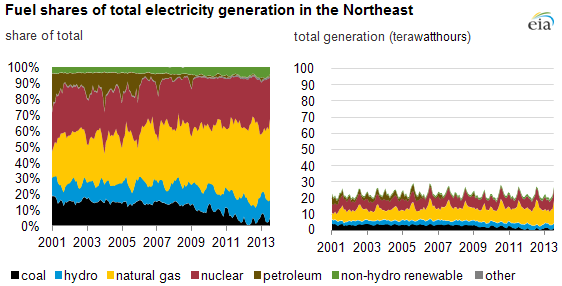 Lower natural gas prices and regional environmental initiatives are leading natural gas-fired generators to provide a greater portion of the electricity in the northeastern United States. The Northeast is a combination of two regional transmission organizations: the Independent System Operator of New England (ISO-NE) and the New York Independent System Operator (NYISO). Both of these systems have seen a dramatic shift since 2001 away from petroleum- and coal-fired generation to predominantly natural gas-fired output in 2012 and 2013. Note: The gray area in northern Maine is an area of the continental United States that is not connected to the wider U.S. grid. The increased use of natural gas for electricity generation has raised concerns about fuel diversity, as the Northeast is also reliant on natural gas for part of its heating needs and has limited pipeline capacity to bring gas to market. 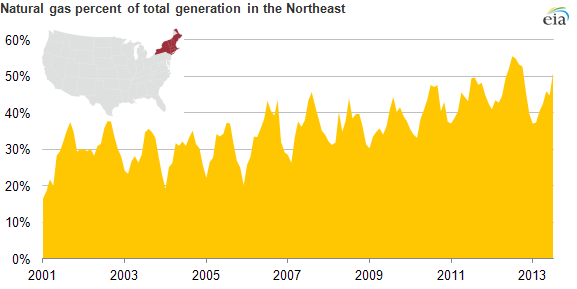 The winter of 2012-13 saw spikes in wholesale electricity prices in New England and New York as demand for natural gas from both electric generators and natural gas distribution companies taxed the capacity to bring natural gas into these markets. In the coming years, there are plans to retire the two largest coal-fired power plants in the region, as well as one of the region's nuclear units. The seasonally-constrained natural gas pipeline network has prompted ISO-NE to issue a special winter reliability plan to procure fuel oil in the event of deliverability problems for the natural gas-fired units. ISO-NE also wants to incentivize demand-side management programs and enhance market monitoring. All of the New England states as well as New York are members of the Regional Greenhouse Gas Initiative, one of the two required cap-and-trade programs in the United States. This program provides a modest incentive for generators in participating states to use fuels with fewer or even no emissions, which also may have contributed to the shift to natural gas in the region.